The Boston Red Sox came into the ALCS as serious underdogs against the Houston Astros. 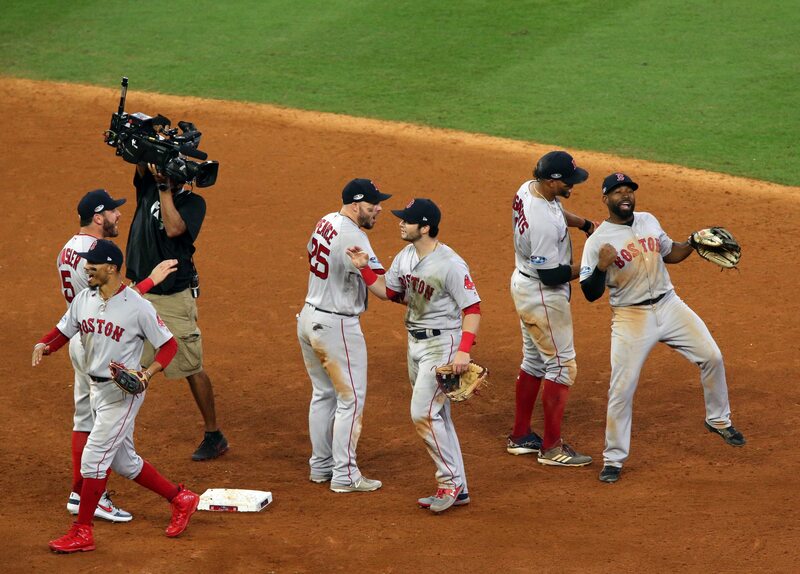 Picked by many to lose to the superior team, Boston emerged victorious and is now headed to the World Series. Boston fell behind early in the series after Chris Sale struggled in a Game 1 loss. Predictions for the team’s demise intensified, but the Red Sox surprised everyone and rebounded with four consecutive wins and an AL Pennant. The Red Sox pulled off the upset for a variety of reasons, including some surprise contributions from unexpected players. On the other side, Houston finds itself ousted in a series where several players disappointed. Here are the winners and losers from Boston’s ALCS victory over the Astros. It’s been years since fans have seen Bradley Jr.’s bat carry him to prominence. This year’s ALCS changed the script as the 28-year-old’s bat ultimately carried this team with clutch hits to swing the series. Two crucial at-bats stand out for Bradley Jr. and capture his timely hitting in this series. In Game 3 with his team in need of insurance runs, he drilled a grand slam in the eighth inning to give Boston a decisive victory and a 2-1 series lead. He came through the next night with a go-ahead blast in the sixth inning of Game 4 and swung momentum in Boston’s favor once again. Bradley Jr.’s monumental home runs deserve the attention, but fans also can’t forget the three-run double in Game 2 that turned a two-run deficit into a one-run lead. October seemed to flip a switch for the veteran outfielder and he’ll now become a player to focus on in the World Series. Two key moments swung this series entirely and Osuna is responsible for one of them. While he didn’t pitch in 10 days when he entered in Game 3, the lengthy absence isn’t entirely to blame for his disaster. A.J. Hinch turned to Osuna with the hope he could hold a one-run deficit in the eighth inning against the Red Sox. After a solid start to the inning with two outs and one hit allowed, things unraveled into a five-run disaster. If not for Osuna’s complete collapse on the mound, the Astros could have attempted a comeback in the final two innings down only a run. Instead, the Red Sox coasted to a victory and took an early 2-1 lead in the series. Houston may have fallen short this postseason, but Springer did everything he could to keep this team alive in the postseason. Ultimately, his teammates just didn’t do enough behind him to make it happen. Springer raked this October with four home runs and an OPS over 1.000. It added to his growing legacy as one of baseball’s best hitters in the playoffs as the new “Mr. October.” While fans will miss out on more playoff excellence from Springer, he finished the season on a high note. Boston’s bullpen entered the postseason with lingering skepticism about its ability to hold a lead. Kimbrel was the only reliever people trusted and for good reason as a perennial All-Star closer. Fans witnessed a complete reversal of fortune in the ALCS. As the rest of the Boston’s bullpen stepped up, Kimbrel’s postseason collapse became even more disastrous in the ALCS. Kimbrel’s biggest disaster came in Game 4 when he allowed a run in the eighth inning then loaded the bases in the ninth with Alex Bregman at the plate with a chance to win the game. If not for Andrew Benintendi’s incredible catch to win the game, this series might have played out very differently. While Benintendi may not have been as impactful at the plate this series, there is no doubt his game-saving catch made a profound impact on this series. If he missed the ball in left field and it bounced past him, Houston wins Game 4 and ties the series. Boston would then be facing Justin Verlander in Game 5 with David Price on the mound, a recipe to fall behind in the series and be on the brink of elimination. Instead, he made one of the clutchest defensive plays in postseason history. October has proven, whether he is producing at the plate or in the outfield, Benintendi is a game-changing weapon for the Red Sox. Even if the ratings are through the roof, MLB will come out of October with a serious problem on its hands. After Angel Hernandez’s blown calls stole the spotlight in the ALDS, West stepped into the spotlight when he ruled Jose Altuve out on fan interference. West’s decision proved costly in a tight game and MLB’s replay center stood by his call due to insufficient camera angles. West blew the call and it cost Houston dearly in a pivotal game, yet MLB continues to stick by its umpires. Prominent umpires blowing critical calls on national television is becoming a recurring issue and MLB must address it this offseason. If Boston goes on to win the World Series, there needs to be a movie about Brasier’s breakout year. The 31-year-old went from playing in the minor leagues in Japan to being Boston’s best reliever in October. He pitched in each of the first four games against Houston and dominated with a .188 batting average allowed and zero runs in 4.2 innings. Once a long shot to make the roster out of spring training, Brasier is now the most trusted reliever for a team heading to the World Series. It’s difficult to find a bigger winner than that. Houston’s rotation was expected to carry them in this series, but it proved to be quite the problem. Specifically, Cole’s disastrous start in Game 2 provided a major setback for the Astros. Cole immediately put Houston behind with two runs allowed in the first inning. After the Astros bounced back and gave him a 4-2 lead to in the third inning, Cole immediately allowed Boston to jump back on top. There’s just no excuse for this poor performance. If Cole pitched remotely close to his top form, Houston cruises to a two-game lead in the series and heads home with all the momentum. Instead, he injected life into Boston and the Astros never regained that momentum. Of all the surprises this postseason, nothing shocked more people than Price’s outing in Game 5 on short rest on the road. The 33-year-old entered Thursday with a career 5.42 ERA in the playoffs and allowed seven runs in two starts this October. On only three days of rest, Price simply dominated in the most-difficult circumstances he’s faced in years. While he used all of his pitches effectively and recorded a strikeout on his changeup, cutter and fastballs, Price’s real dominant pitch was the changeup and it helped him finish with nine strikeouts across six shutout innings. The pitcher who couldn’t buy a win in October won the clinching game to send Boston to the World Series. Baseball can be a game of luck and that proved to be the case for Bregman. It’s not as if he struggled in this series, the 24-year-old simply fell victim to phenomenal defensive plays and smart pitching. If Benintendi misses the ball on his dive in Game 4, Bregman gets credited with a game-winning, three-run double that ties the series. He was also robbed of a big hit in Game 5 thanks to an outstanding grab by Mookie Betts near the wall. When Boston wasn’t robbing him of extra-base hits, it often pitched around him and accepted a walk as an acceptable outcome. Once he got on base, the Red Sox would retire the hitters behind him. Bregman’s misfortune captures one big reason why Houston’s season is over. The timely hits just never dropped and it made all the difference.